I was asked to review this book, but the following review is my true and honest opinion. When I saw the cover of this book all of my cuddly fangirlishness seemed to spew out of me. I love little boys. Ok, that sounded creepy. What is mean is that young boys, in my mind, make some of the best main characters, and I always find it really interesting to read things from their point of view. Andy is the nerd everyone makes fun of. He's really skinny, wears glasses and talks to himself, but he falls in love with the prettiest girl in the class. One day Grandpa dies and turns into a ghost. Then, Andy discovers a new power, he can see ghosts and talk to the dead. 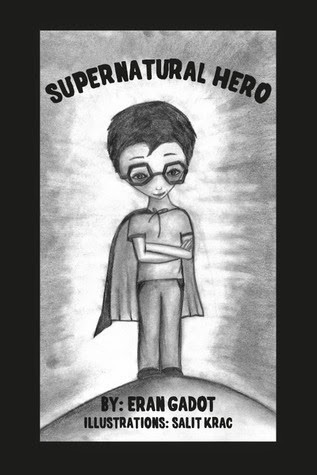 Join Andy's journey and find out how a nerd can become a hero. I really wish that this book had been longer. It was a cute read. The beginning was a little hard for me, because poor Andy seems to have been dealt a bad family. I just wanted to cuddle him and tell him everything would be ok. And I loved that he was so close with his grandpa, just like me, so it was something that I could really relate to. Now let's get into the nitty gritty. The ghosts. So, Andy has been seeing and talking to his grandma's ghost for years, but he suddenly can't understand it when he see's his grandpa's ghost. That was something I had a hard time with, especially since later in the book you find out he sees all kinds of ghosts. You think he would be more understanding of it all. But really that was the only flaw that I saw in the book. It really felt like a good coming of age story, where Andy realizes that he needs to speak up and be himself and things will go his way. I also really liked a lot of the philosophies that his grandfather taught him. There are quite a few lessons to learn in this book, whether you are a child or an adult. There were also some parts where I got to relive the frustrations of being a child and having no control. Andy couldn’t control anything, his parents didn’t understand him and sent him to therapy, and when his sister bullied him his parents never took his side. I had forgotten that feeling, the one that feels like you have no say over your own life. I thought that came across very strongly here.